About the Book: During World War Two, soldiers are fighting against discrimination and injustice. Yet prejudice was happening on the home front in America as black soldiers were not being integrated into the army and many were given service jobs. A group of soldiers fought back against this injustice and formed the 555th-an all black soldier unit that trained to become paratroopers. 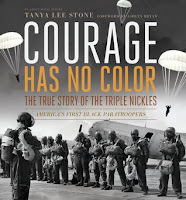 GreenBeanTeenQueen Says: I really like Tanya Lee Stone's nonfiction. 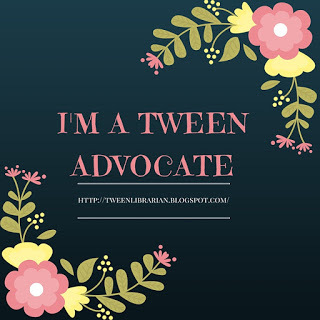 It's easy to read, accessible for a wide range of readers (this could easily be given to fifth grade students and high school students) and the detail is obvious. I'm not an avid reader of nonfiction. In fact, it's one area I struggle with as a librarian because it's so out of my reading comfort zone. But Courage Has No Color is an incredible story that pulled me in. This is a book that I think readers of nonfiction will enjoy, but is a great gateway into nonfiction for those who are reluctant to try something other than fiction. The text is written in a nice narrative format with lots of quotes and details, yet I never felt as though it got bogged down in dates and facts that I got lost. I love when I learn something new about a history and this is a story that needs to be told. The story of Triple Nickles, the name the 555th unit gave themselves, is inspiring. This group of brave men stood up for what they believed and decided to show the Army that they deserved equality and could do the work of a soldier. In the author's note, Ms. Stone mentions how this book was her hardest to write because the history of the Triple Nickles was scattered. Her extensive research shows throughout the writing and I think the book is especially strong because of the many first person accounts Ms. Stone is able to pull from. There are many black and white photographs throughout the book that compliment the text and add to the overall story. This is an excellent addition to nonfiction collections and a story that needs to be told. These brave men paved the way for equality in the military and their story is exciting and engaging. I've been looking for a good non-fiction book for ages - this looks great! Really good review, thank you. I definitely struggle to get into nonfiction as well - although I've been reading a lot of it lately! I like how you described this as "a great gateway into nonfiction." Bomb is coming up quickly on my reading list - maybe Courage Has No Color will soon follow?